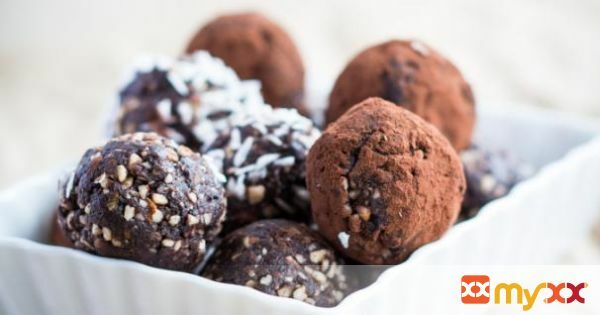 Almonds, cacao powder and dates come together in these delicious and easy Almond Cacao Nut Balls. They are bursting with flavour. You certainly can't tell they are healthy. 1. If you’re dates seem slightly dry, soak them in water for 5-10 minutes. If you’re dates are fresh and sticky, skip this step. 2. Add your almonds to a food processor and blend for about 20-30 seconds or until the almonds are slightly broken down. 3. Stop before the almonds turn into a flour. Aim for small pieces of almonds. 4. Add the rest of the ingredients to the food processor and blend for another 30 seconds to a minute until everything starts coming together. 5. Once the ‘batter’ is sticky and you are able to press it together, form 12 small balls. 6. You can either leave them plain or roll them in shredded coconut or cacao powder. 8. They should remain fresh for two-three weeks.